Legacy software companies get no respect — or market valuation — compared to Software-as-a-Service (SaaS) players. New research shows that over the past year, SaaS company valuations grew twice as much as valuations of legacy software companies rooted in the client-server world. And that SaaS valuation trend will continue for the next 12 to 24 months, according to new research from Martin Wolf M&A Advisors. For an old-line company it makes sense to freshen up with a SaaS purchase, even paying top dollar in anticipation that the target’s value will rise as more companies get comfortable offloading tasks from on-premises to a service model. At the same time, existing SaaS players want to broaden their services portfolio with more vertical SaaS options, said Martin Wolf, president and founder of the company. Wolf’s numbers show that a select group of SaaS companies saw their values grow 313 percent from January 2009 to October 2011, compared to 154 percent growth for other software companies over the same period. No wonder Oracle (s ORCL) shelled out $1.5 billion for RightNow Technologies and Salesforce.com (s CRM) keeps snapping up smaller SaaS players every month. “With Saas, the more vertical the better,” Wolf said in interview. SaaS companies offering financial services, healthcare services or employee benefits outsourcing services, are all hot now, he added. So who’ll be buying? The usual suspects: IBM (s IBM), Oracle, SAP (s SAP), Microsoft (s MSFT). The only potential hurdle Wolf sees to these up-and-coming SaaS companies are macro factors, external economic events. SaaS as a category is also clearly vibrant compared to mature IT supply chain service providers like distributors Ingram Micro, Arrow Electronics and resellers. Valuations in that category grew 142 percent for the period tracked. Business process outsourcing (BPO) companies, on the other hand, will see better valuations driven by demand and the availability of more targeted point products and inexpensive outsourcing for human resources, legal and other vertical tasks. 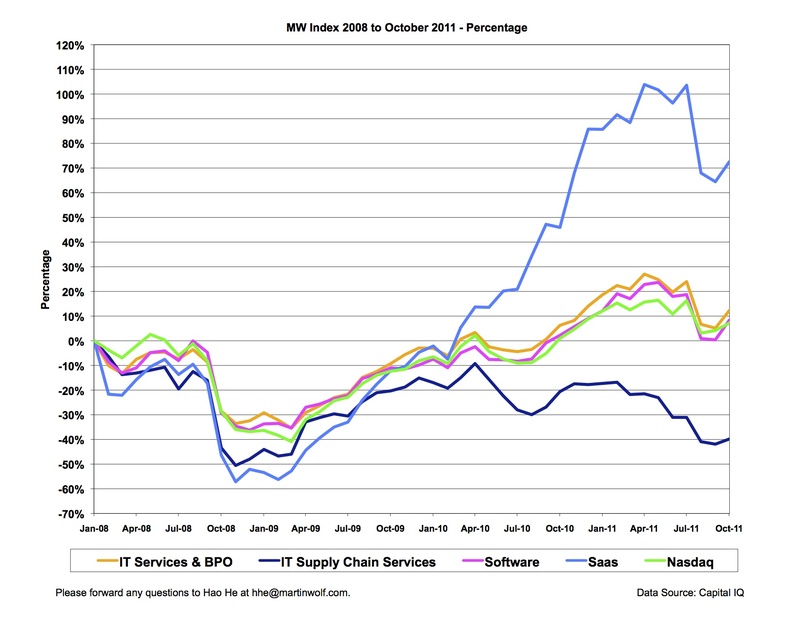 The IT services and BPO category saw its values rise 150 percent over the two years. “These companies may be cheap, but they’re also very good at what they do,” Wolf said. 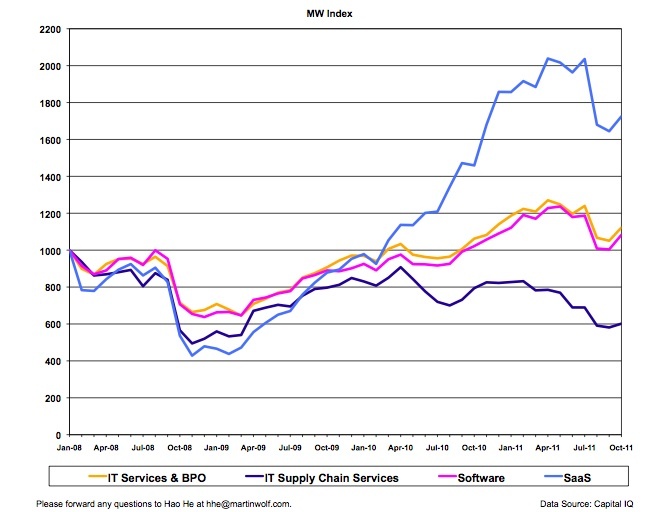 Wolf’s market-weighted-value index takes the market value of 120 companies grouped into four technology categories: IT services and BPO; IT supply chain services; software; and SaaS. The index assigned a value of 1,000 to each composite group on Dec. 31, 2008, and has tracked the category performance since then. As you can see from the chart, SaaS valuations (the index tracks 20 SaaS companies including Salesforce.com, Open Table (s OPEN) and Taleo (s TLEO)) tower head-and-shoulders over the other three categories. The software category comprises 45 companies including SAP, Citrix (s CTXS) and Tibco (s TIBX); CA (s CA), Symantec (s SYMC) and Adobe (s ADBE). The IT services group includes professional service providers/integrators like Accenture and Sapient; financial services companies like Equifax (s EFX); IT outsourcing experts like Computer Sciences Corp., (s CSC) and BPO players like ADP (s ADP). Of course, as Oracle, SAP, IBM, Microsoft et al. keep buying more SaaS talent, the line between SaaS and these legacy software companies will blur, making such comparisons more difficult.